Some users running on Mac OS X Lion 10.7.x or Mountain Lion 10.8.x may encounter an operating system “spinning beach ball” hang lasting several minutes when deleting 1000+ jobs from the Queuemanager. During this time the Dock will be unresponsive and using 100% CPU. The reason for this was found to be the Dock tracking the /Applications/ folder for file changes and updating its internal filetype mapping each time a file is added or deleted. to another location outside the /Applications/ folder. IMPORTANT NOTE – all existing files in the new (and old) working path directories will be deleted at server restart. This means all jobs will be deleted from the QueueManager. 1. Navigate to a chosen folder location (or create a new folder) outside the /Applications/ folder. 2. Create 4 new folders named ‘drop’, ‘raster’, ‘spool’ and ‘tmp’. 3. Open the Serendipity Client. Choose Server Settings from the Server menu. 4. Select the Working Paths tab of the Server Settings window. 5. Click each of the Raster, Spool, Temp and Drop buttons. Use the file chooser to navigate to and select the new folder location for each working path. Read the warning message and click ‘Yes’ to change the path. 6. Hit OK on the Server Settings window to save the Working Path changes. 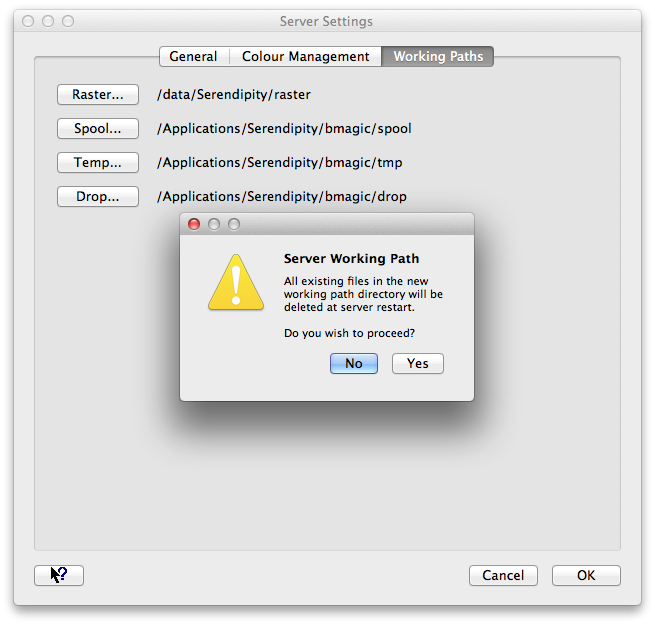 A message pop-up will inform you a Server Restart is required to load the new working paths. 7. 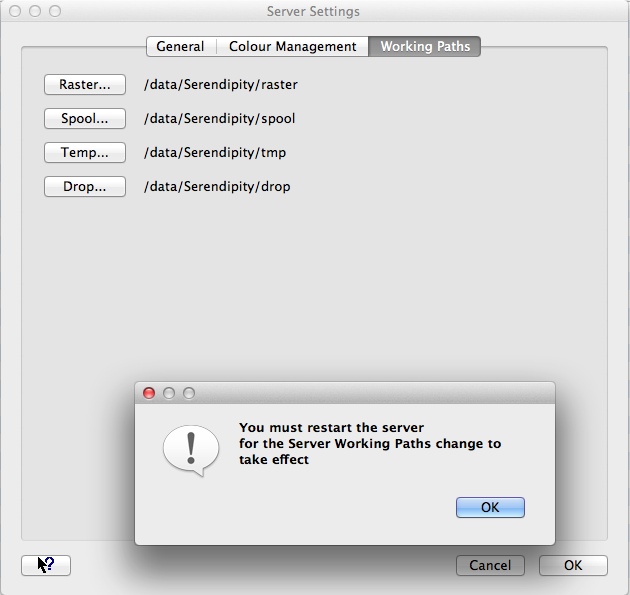 Shutdown, then restart the Serendipity Client and Server.